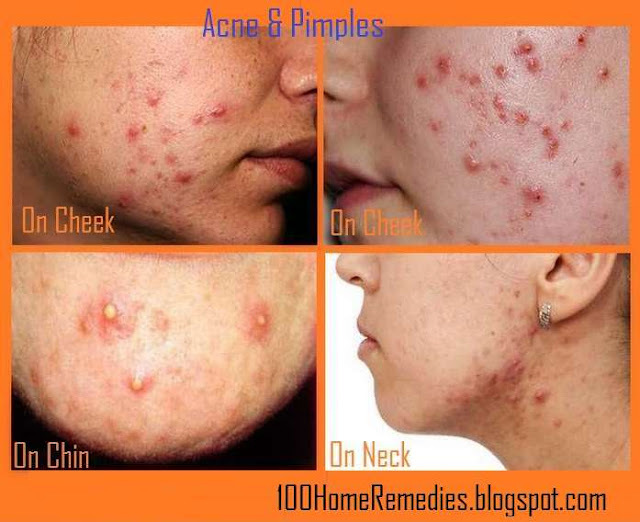 In pimples, the skin pore are affected, whereas in acne the hair follicles get affected. Pimple emerges due to blockage in the skin pores and may not be genetic, while the acne results due to androgen stimulation and can be genetic. Both can be treated with prescribed and over the counter medicines and possibly by home remedies. The picture below shows the pimples and acne on cheek, chin and neck, which are quite swollen and red. The pimples on the chin are red bumpy and pus-filled lumps like small boils. Your kitchen pantry has already many surprising ingredients like honey, lemon, spices, fruits, etc that can cure your acne and pimples, and acne marks. You have to try one of the remedies and see the results, if one does'nt work then try the other one. Treat your acne with steam that will open your pores and help get rid of oils, dirt and bacteria trapped inside. Fill a small tub with hot boiling water and allow the steam to come in contact with your face for a few minutes. Rinse your face with warm water. Apple cider vinegar and lemon juice are natural astringent. 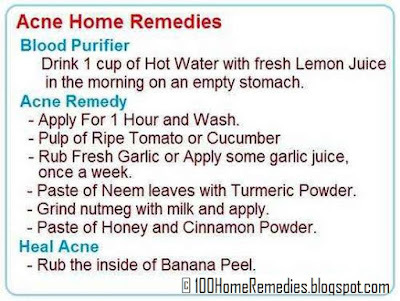 Apply any of these on your pimples using a cotton ball and leave for overnight. Garlic contains allicin which gives it mild antiseptic and antibacterial properties. Make a paste of crushed garlic and water and apply on the blemish. Wash after 5-10 minutes. Apply egg white over your acne. and leave for 10 minutes. Rinse off with water. Honey has antiseptic and anti-inflammatory properties. Treat your pimples with a dab of honey. Leave on for 5 -10 minutes and then wash with warm water. Baking soda makes a great exfoliant. Make a paste of baking soda in water and rub on your face. Leave on for 5-10 minutes, then wash with warm water. Make a paste of avocado and honey and apply it to your skin. Wash your face with lukewarm water after 15 minutes. Crush an aspirin make its paste in water and make a paste. Apply this paste on the pimples and then rinse off with warm water after 15 minutes. The salicylic acid in aspirin will cure pimples. Wrap an ice cube in a cloth and hold it on the pimple for some time to reduce inflammation. Put a cold cucumber slice on the skin to hydrate acne and reduced its swelling. Rub shredded white potato on the skin for 2 minutes. The niacin in potato helps lighten acne marks and scars.